The 19th Century marks the period when people started to define what a cocktail is and, having set those rules, starting to push those boundaries. Look at Jerry Thomas’ guides for bartenders – there’s a literal ton of recipes in there, all pushing, all striving for recognition. Some of them made it into the 20th Century, into popularity. Hell, some of them even made it into fame. Some of them didn’t. This is the story of one of them. Think of the 19th century as the mixed drink equivalent of the Big Brother house – packed full of competitors, each with an eye on the prize or whatever they can get their hands on. It’s a dirty business, but some genuine stars made it out – the Manhattan, the Old-fashioned, the Sour, the Collins spring to mind. A couple almost made it, but not quite – the Martinez had to lose a bit of vermouth to get to the top table, for example. And then, there’s everything else. One of the drinks that didn’t make it was the Daisy. Being honest, it wasn’t going to. As David Wondrich points out, the recipe set out in the 1876 edition of Thomas’ guide is basically the same as a Fizz with the addition of “3 or 4 dashes [of] orange cordial” and there’s always the sticky little topic of what actually differentiates a Fizz from a Collins. Searching for its own niche in the cocktail world, the Daisy eventually settled into a fairly set recipe of spirit, lemon juice and grenadine, sometimes even eschewing the fizzy hat that had characterized its earliest incarnations. Turning back the clock to that first instance of the Daisy isn’t as challenging as I’d hoped or feared. For one, Wondrich has done all the hard work in Imbibe. But by this point, I’ve committed to the Daisy – I want to see if it’s been done a great disservice by history. I wonder if we’ve let a gem slip into obscurity. In order to make my Daisy authentic, I decided to look at the ingredients available to the 19th century bartender. Vodka is entirely absent from early cocktail guides, rye seems to be the popular choice for whiskey and there is, of course, the question of gin. Gin as we know it is largely different to the gins used in the early years of the cocktail. London Dry Gin – the dominant style in today’s marketplace – was new, and largely unheard of outside of the UK. Instead, the majority of gin drinks call for either Old Tom gin (similar to London Dry, but sweetened) or Holland’s Gin: genever. All of this led me to the opportunity to buy an obscure spirit, which isn’t something I’m ever going to pass on. A couple of days of searching Edinburgh’s various specialty off-licences finished with me taking possession of a bottle of Amsterdamsche Oude Genever. Genever is the forerunner of modern gin. It’s made by flavouring a base spirit with juniper and other herbs, like a London Dry Gin, but the difference lies in that spirit base – genever is based on maltwine, distilled from malted barley. This brings its own flavour to the table, as opposed of the neutral base of an Old Tom or London Dry. An Oude (old) genever must contain at least 15% maltwine, and no more than 20g of sugar per litre, whereas a Jonge (young) spirit can’t have more than 15% maltwine and 10g sugar per litre. The Amsterdamsche Oude has a slight colour to it, a very pale bronze, and surprisingly doesn’t taste a million miles away from a London Dry. There’s a nice current of maltiness under the juniper but, given Wondrich’s suggested substitute (8 parts Irish whiskey to 10 parts Plymouth Gin, with a touch of sugar), I was expecting the flavour to be more out there. Fill glass half-full of shaved ice. Shake well and strain into a glass, and fill up with Seltzer water from a syphon. Served long over ice, the Daisy is pretty disappointing. 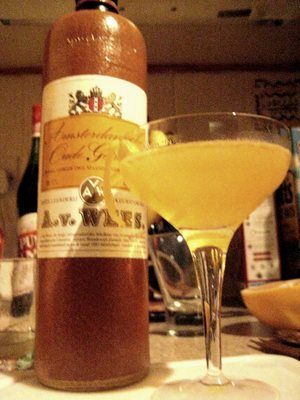 The orange cordial (I used Grand Marnier) barely comes through, but the malty base of the genever stands out. Juniper and citrus appear on the finish. For me, the most disappointing aspect was the mouthfeel – the texture was quite thin and watery, with very little fizz. I can’t shake the feeling that the formula is missing something. Second time around, I went even more old-fashioned, serving the same recipe straight up in a coupette. The texture’s better, less watery but still lacking something. There’s a greater degree of effervesence from the seltzer but it’s still not what I’d call bubbly. In terms of flavour, there’s no great difference from the long serve. Sitting here in the 21st century, it’s refreshing to look back at drinks that have passed out of the zeitgeist. A Gin Daisy is a cracking little drink, but it’s missing something that a Collins or a Fizz have; that elusive mystery ingredient that elevates one recipe from the pack to the lead. In the case of the Daisy, it may be the inclusion of an ingredient that blew its chances – if the only difference between a Fizz and a Daisy is the orange component, and the orange component doesn’t add anything meaningful to the drink, then it’s simply easier to go with the formula that doesn’t have it. All of this is speculation. After all, who knows why some drinks make it and others don’t? There’s more to it than flavour alone, but part of me is glad that the lowly Daisy hasn’t been totally forgotten. It’s not a headliner but it’s part of the history, another link in the DNA of cocktails. This entry was posted on	September 14, 2008 at 4:37 am	and is filed under Mixology, MxMo, Recipes.